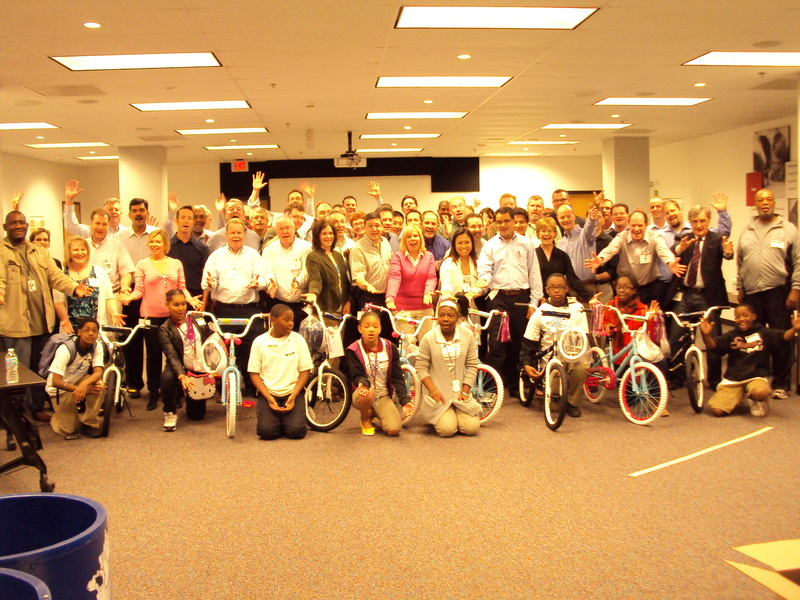 Managers and Team Leaders of Nestle Purina Pet Care from across the US and Canada came together in St. Louis for a series of meeting that included a Build-A-Bike Team Building Event. The morning activity was filled with fun, learning and team building. Over 50 people built 8 bikes amidst the laughter salted with a little bit of instruction. Everyone enjoyed the activities that culminated in the bicycles being donated to children from the Boys and Girls clubs of of Greater St. Louis. The children were present at the end of the program to accept the bikes- much to surprise the bike builders. It was a great feeling when those who had participated in the event got to see the children’s faces and talk with those who were receiving the bikes. It was a very touching moment to end a morning of fun and learning. Often times we get caught up in our own lives. We’re working; we have families, other activities and so many draws on our time. We forget that we also have opportunities to make a positive impact on lives around us if we will just stop and look around. Even in corporate programs it is easy to have meetings and training events, and forget the impact we can have not just within the organization, but within the community. When these special people came together it was to benefit others, not just themselves. They had their necessary meetings, but then they got an opportunity to relax, have fun and make a significant contribution to their community through the Build-A-Bike Team Building Event. They also got to see everyone in a little different environment than usual. Especially since many of them work as virtual teams communicating through email and phone calls and conferences. This exciting event gave them face time with each other, as well as a fun and fast-paced atmosphere t enjoy and get to know each other. The added satisfaction of giving back to the community was an added bonus. Thanks to Nestle Purina Pet Care for a great event and for your support of children and families in St. Louis. As this law firm experienced, it is possible, and even beneficial, to get together for some fun learning and make a contribution to those less fortunate.